I am having a problem when using a dark theme on Xubuntu 16.04 both with Opera Stable and Opera Developer. With Opera Stable, many text boxes's text become nearly invisible, due to the white background with white text. This is frequently a issue when searching text. The white text can be seen here, visible only due to the fact no matches were found. 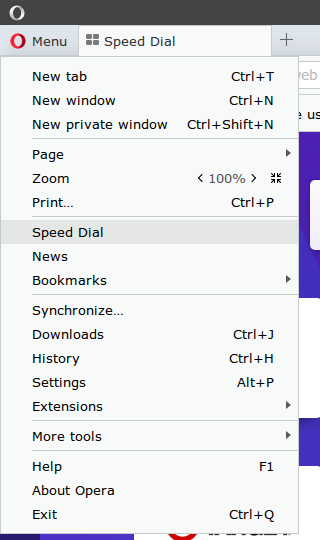 With Opera Developer, using the Opera's dark theme, this issue don't happen, but another is happening: the menu options are invisible. Invisible because of white background with white text. The only way to see them is hovering the mouse over the option. Here is a screen capture with the problem (the compositing problem was already discussed in another topic, I hope it is solved). If the Opera Developer uses the menus as the Opera Stable is using, I believe the Developer version will be completely compatible with dark themes. The same if Opera Stable has the text boxes corrected. PS. : I hope the images don't make this post look horrible. I second that. 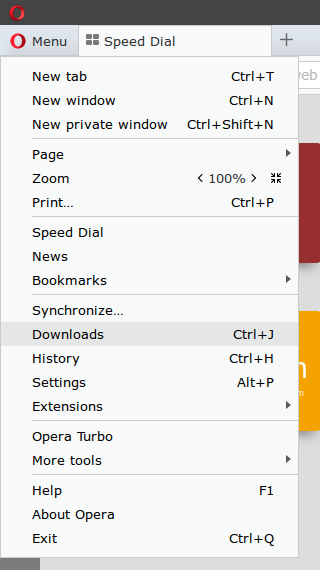 Opera 45+ seems to use the (gtk2) theme's font color, eg white, but not the theme's widget color, eg grey. Instead, it uses plain white for the menus. And it results to white menus with white text, making it unusable. Using a "dark text on light background" theme, eg adwaita, arc or clearlooks, solves the problem, but I really hate light themes. Debian testing x64, on plain openbox, using a similar "light leters on dark background" theme (numix) and opera stable (44 today) and beta (45 today). If the problem remains until the time opera 45 reaches stable, I will drop opera and look for another browser. Opera 45 reached stable a few minutes ago and neither the dark theme bug, nor the compositing one was solved. Goodbye opera. I'm using Seamonkey for most browsing as the dropdowns are just to hard to see. Please put in some REAL themes that we can use, I don't consider wallpaper themes, I consider them pictures for background. This Dark Theme problem has existed for over a year while using UBUNTU. I am currently using Ubuntu 17.04. I used to use Opera as my primary browser but the illegible text issue put me off so I quit using Opera about a year ago. I am now back because I love the speed of the browser and its simple design and I was hoping that the issue had been fixed, but it hasn't. Really, it's just a question of putting dark backgrounds in the small text boxes, something that has just been overlooked. Please fix this simple problem so that the browser is usable and I will continue to use it. No, nothing new. This bug and the compositing one first appeared when opera 45 entered developer, which was on early March. 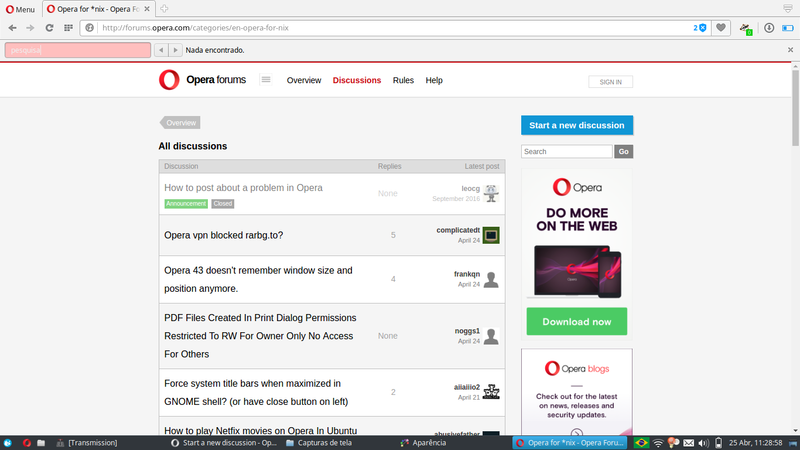 It is mid-May, opera 45 has passed though beta, reached stable and the 2 bugs are still there. Plus, they remain unfixed even on opera 46 (on developer and beta today), which means that in case they fix them, they will appear on opera 47! to make texts in menu readable. The program window generally behaves weird (maybe because of the compositing issue), e.g. it's impossible to take a region screenshot with the menu open. Overall, Linux version of the browser feels quite unpolished and not really ready to be labelled "stable". P.S: Many years ago I was taking part in the discussion regarding UIQ support, which has been dropped eventually. Now it seems that Opera is not really bothered with Linux support either, for the same issues travel from build to build. I really love using the Opera Browser, but such attitude from devs is unpleasant. i am on ubuntu 16.04 using unity an i can confirm that opera(45.0.2552.812) takes gtk2 theme settings instead of gtk3. i am not so much into gtk or themes at all but i worked around this by using gtk2 definitions in my dark theme (vivacious-unity-zfusion) from a corresponding light theme. 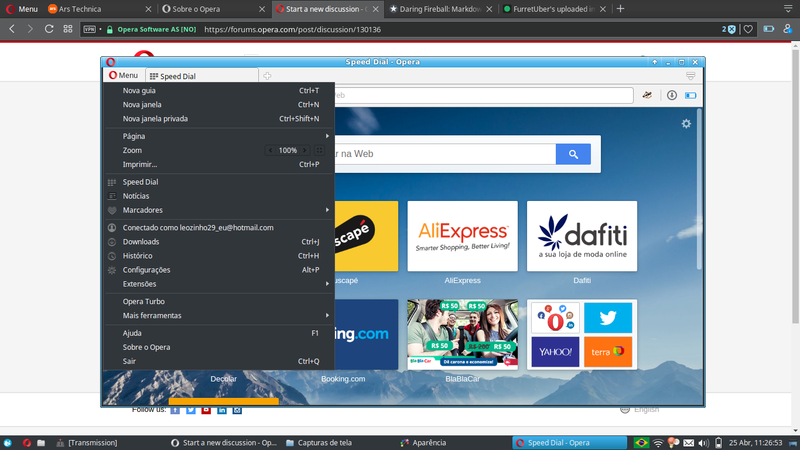 Opera IS supposed to follow gtks's theme since it IS a gtk2 app! The same applies for other gtk2 apps, like ff, chromium, tb, gimp and many more apps that are still made with the gtk2 toolkit. If you check their dependencies, you will notice they all depend on libgtk2.0. I use numix as gkt2 and gtk3 theme and the problem is still there. Why? 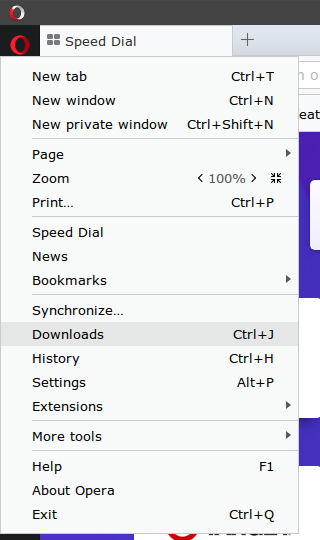 Because opera decides to follow the theme's colors for the selected menu entry and its background, but not for the rest (unselected menu entries and their background). And that is exactly what you see on the screenshots above. Obviously, I do not plan "hacking" a great theme like numix in order to change the looks of ONE app that all of a sudden decided to have a "unique look". of course it is a bug which will hopefully be fixed soon. the background color of the context menu seem to be the only problem in my mind. assuming it would be dark, following dark themes, the rest of the colors (selected,enabled, disabled items) would fit to the theme. i was not aware of which apps use gtk3 and which ones gtk2 therefore i was little be confused about opera using theme settings for gtk2. Finally, the compositing and the dark theme bug are fixed in today's opera developer release! Well, in all fairness, it is sad that the bugs had to reach opera stable and affect more users and then "force" the devs to issue a fix. After the last update, the menu is shown correctly and the compositing problem was solved in Opera Developer. When this updates are made on Stable, this topic can be marked as solved. 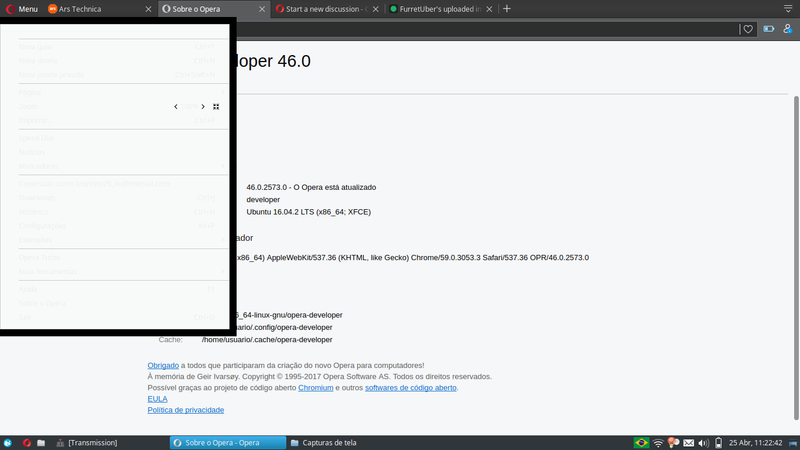 I use opera 45 stable with dark theme in ubuntu 16.04 and the menu is illegible (very clear) how do I do the update that fixes the bug? Or does the fix exist only for opera developer? The bug first appeared when 45 made it to opera developer on early March, but the devs did not fix it until 45 reached stable, thus was available to many more users and received lots of complains. It was fixed just yesterday on opera developer, so you have 2 choices if the bug affects you too much: either wait until 46 reaches opera stable, or install opera developer today. The fix was ported to opera beta which was released yesterday, so now we all wait to either be ported to stable as well or 46 to reach stable. How many of you have switched from opera stable to opera beta or opera developer now that the bug is finally fixed? Omg! The fix was ported to opera stable earlier! The screenshot is from my non-stock opera-stable (I keep opera-beta and opera-developer stock). Well done to the devs! So build 46.2602, which I gather fixes this problem, now requires GKT-3, while any of the previous builds (I was using 46.2556) was perfectly happy to work with just GTK-2. I think this is bad. The new, higher requirements cut off from opera all Linux distros that don't include native GTK-3. Those are mostly the minimalistic distros (minimalistic not in the sense of "very few users" but rather "low system resource needs"). Is there a possibility to go back to GTK2 in a future build?